It's not uncommon to look down at your wrist and notice this foggy circle in the middle of your watch face. This is generally due to a faulty crown (the rotating piece pictured above that sits on the side of your watch), many crowns simply 'push-in' leaving gaps where water can get in when you're out on adventures. With Momentum that simply won't do. We use high-quality 'screw down crowns' that thread into the case and feature water sealing gaskets. Meaning that you won't have to do the inevitable 'sigh' that comes with the dreaded ring of fog. A screw down crown creates a seal when the crown locks with the cases internal threads and gaskets, fastening it into place securely. Adjusting the date and/or time on a watch with a screw-down crown is still simple, simply unscrew the crown counter clockwise until it springs open then gently pull it out to the first or second click position. When you have finished setting the watch, the crown must then be pushed and screwed back in tightly. This step is very important as it ensures the water-resistance of the watch, not doing so may result in flooding. Overall, this process should not require a lot of effort or force. If you've ever felt your stomach drop when you realized your watch has flooded, it might just be time to treat yourself to a timepiece that can take a hit and survive the "oops" situations. 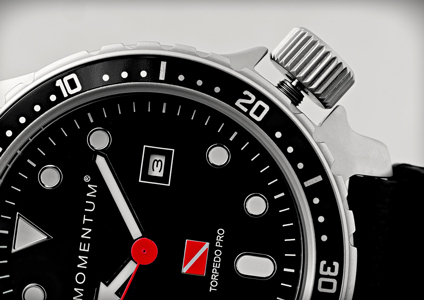 Momentum watches are equipped with screw-down crown systems to back you up. Give us a call or send us an email and we’ll help you choose the perfect match for your lifestyle! 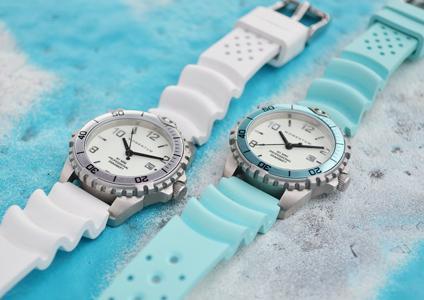 We've found there is a big demand for traditional dive watches, and the Torpedo Pro model says it all with a discrete 'diver down' flag, a solid steel case with unidirectional bezel, and an offset screw-down crown for water protection and comfort. Available in a large 44mm or 29mm size. More protection from accidental opening versus a push-crown system so you can paddle along, however you fancy. Perfect for small wrists. The clean luminous dial is designed for maximum legibility, with a variety of fun colors to choose from. The simplest ideas are often the best ones. Folks from all walks of life continue to jump on board and dive into the world of watches because these objects have a heartbeat and over time grow into something more for us, a symbol of a union, a token of achievement, or an heirloom that's been passed on. Timepieces can be passed through generations and cherished for decades. We'd love to hear the journey of your Momentum watch. Let's talk! Our customers say it best: “I love my watch and I've had my Momentum for years. It was my dad's before and it reminds me of him when I look at it”. Help us spread the word! Share with a friend or submit a review on Facebook or Amazon! It goes a long way in helping Momentum grow.